From the studio who brought you 'Sweet Home Alabama' comes the extraordinary romantic comedy starring Academy Award® nominee Diane Lane. 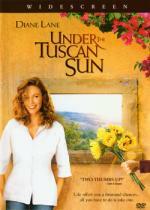 Based on the #1 New York Times best-selling book, 'Under the Tuscan Sun' follows San Francisco writer Frances Mayes (Lane) to Italy as a good friend offers her a special gift - ten days in Tuscany. Once there, she is captivated by its beauty and warmth, and impulsively buys an aging, but very charming villa. Fully embracing new friends and local color, she finds herself immersed in a life-changing adventure filled with enough unexpected surprises, laughter, friendship and romance to restore her new home - and her belief in second chances. A somewhat syrupy and implausible story, but well-known, of a woman who unexpectedly finds herself divorced, believing that she will never be able to love again. Surrounded by some interesting friends, including a lesbian couple who’ve decided to have a baby, some polish house renovators, an aging actress and of course Italian friends and neighbors, she slowly recovers from the wounds of her divorce, falls in love and learns many new life lessons along the way. Diane Lane does a credible job, but I thought Vincent Riotta was marvelous in his somewhat minor role. The scenery is quite magnificent and probably worth a look see on its own merit. An enjoyable 2 hours. Hal - are you having a Diane Lane marathon? I'll have to see what I have of hers because, although I really like her work, I can't remember the last time I watched one of her movies. Wonderful actress, but unfortunately, I only have her in Judge Dredd. Not a great day for anyone, that one. No it was really coincidence that I watched two of her movies in rapid succession. I selected all of the movies for the marathon at the beginning and they were all "unwatched". I liked her in both this and Nights in Rodanthe, but thought Nights was a better movie.